Rep. Balser with Governor Baker and Speaker DeLeo at the bill signing for her landmark gender equity in disability insurance legislation. 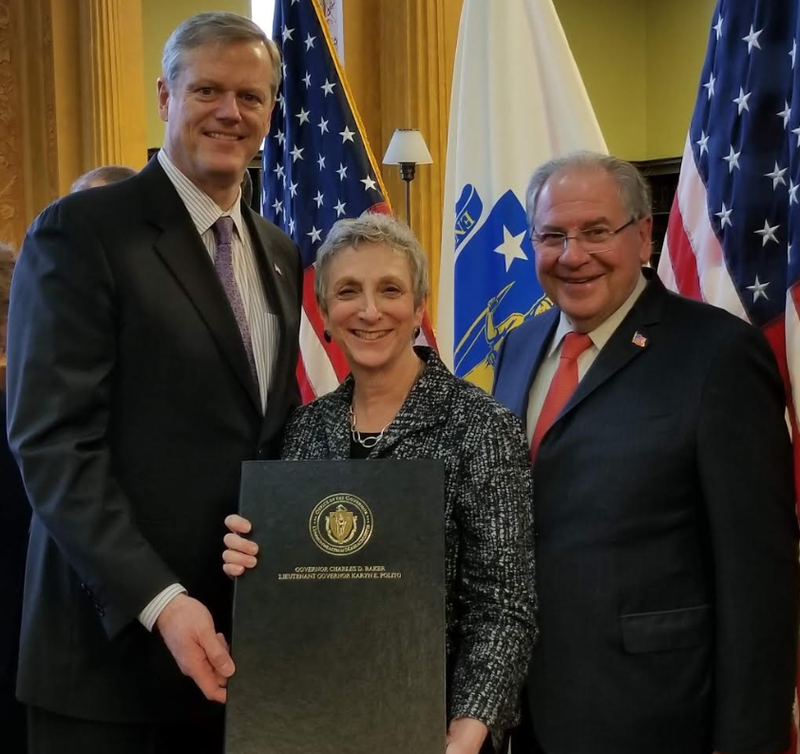 An Act providing for equitable coverage in disability policies was signed by Governor Baker on January 10, 2019 as Chapter 441 of the Acts of 2018. This legislation prohibits charging women more than men for the same disability insurance policy. This legislation had been a top priority for women’s rights, civil rights, labor, and faith organizations for many years. An Act to Establish the Uniform Enforcement of Foreign Judgements was signed by Governor Baker on January 1, 2019 as Chapter 358 of the Acts of 2018. This statute permits enforcement of a judgment from another state in Massachusetts. Without this Act, a person who obtains a valid judgment of a court in another state would have to re-litigate their case. An Act Promoting Humane Conditions of Confinement and Enable Safe Reentry and An Act Establishing a Segregation Oversight Committee, two bills limiting and overseeing solitary confinement practices in state prisons, were incorporated into omnibus criminal justice reform legislation and signed into law on April 13, 2018 as Chapter 60 of the Acts of 2018. An Act Authorizing the City of Newton to Lease the John W. Weeks School for a Term of Years Not Exceeing Ninety-Nine Years and to Grant a Leese Extension to the Current Lessee of the Former John W. Weeks School without Undertaking a Procurement Process, was signed into law on September 12, 2018 as Chapter 242 of the Acts of 2018. An Act authorizing the city of Newton to amend the income qualifications for a certain tax deferral program, was signed into law on November 8, 2018 as Chapter 294 of the Acts of 2018. Resolve Examining Commonwealth Procurement Policies Relative to Congo Conflict Minerals was signed by Governor Baker in January of 2017. This Resolve requires an examination of the Commonwealth’s purchasing policies regarding specified minerals from the Congo to ensure compliance with the Dodd-Frank Wall Street Reform law. Encouraging compliance with federal law, this Resolve will ensure that the Commonwealth does not purchase products containing conflict minerals from the Congo that fuel conflict or result in human rights violations. An Act Relative to the Massachusetts Child Psychiatry Access Program is now Chapter 160 of the Acts of 2016. This statute requires the Department of Mental Health to operate a statewide program (MCPAP) to provide mental health consultations to primary care physicians, pediatricians, nurse practitioners, and providers of women who suffer from post-partum depression, and requires commercial insurers to pay their fair share of the cost. An Act relative to the charter of the city of Newton, signed by the Governor in November 2015, and is now Chapter 87 of the Acts of 2015. This bill changes the Board of Aldermen to City Council, to take effect January 1, 2016. This bill allows greater flexibility for the City of Newton in scheduling elections. On his second to last day in office, January 5, 2015, Governor Patrick signed my bill, An act relative to the treatment of mentally ill in prisons. It is now Chapter 446 of the Acts of 2014. It will protect severely mentally ill inmates from being sent to solitary confinement, and instead to secure treatment units. It is an important step towards addressing mental health issues within our criminal justice system with treatment rather than punishment. This bill was signed into law in August 2014 as part of the historic gun violence prevention act. It is now Chapter 69, Section 1p of the Massachusetts General Laws. It encourages schools to foster a “whole-learning environment” so that the behavioral health needs of students are addressed. The legislature included it in the gun violence prevention bill out of a recognition that addressing behavioral health issues is essential in preventing violence. The act was signed into law by Governor Patrick as Section 103 of An Act Relative to the Reduction of Gun Violence, Chapter 284 of the Acts of 2014. As a result of this legislation, doctoral level psychologists will be able to perform their clinical training requirement in a school. What was originally a separate bill was included in the historic gun violence prevention legislation out of a recognition that one key to preventing violence is ensuring the early identification of psychological problems and facilitating access to mental health services through the schools. This section will ensure that there are well trained psychologists in the school setting. The act was signed by Governor Patrick on July 2, 2014 and is now Chapter 157 of the Acts of 2014. This bill requires that health plans must disclose their criteria for making insurance decisions beginning August of 2014. This act was signed into law by the Governor on November 25, 2013 and is now Chapter 154 of the Acts of 2013. The statute allows the City of Newton to purchase the Waban Hill Reservoir for the purpose of conservation and recreation. Signed into law on December 28, 2012. It became Chapter 374 of the Acts of 2012. The statute updates the licensing requirements for psychologists, bringing them in line with other professions, improving their opportunities for training, and facilitating a reduction in their student debt. Representative Balser with Rachel Geller who was the lead citizen advocate for the bill at the Governor’s signing. This law requires nursing homes to give out to families on admission a brochure produced by the Department of Public Health that informs consumers of the laws and regulations overseeing nursing homes. This simple but important piece of legislation gives consumers of nursing home care the tools they need to ensure quality care. It was signed by the Governor in July of 2010 and is now Chapter 198 of the Acts of 2010. This legislation significantly expands access to mental health and substance abuse treatment. The Mental Health Act of 2000 had extended full coverage to 9 serious mental health conditions but maintained caps on coverage on all other disorders. The 2008 legislation adds substance abuse, eating disorders, post-traumatic stress disorders, and autism to the list of conditions with full parity. It was signed by the Governor on August 5, 2008, and is now Chapter 256 of the Acts of 2008. Determined to prevent fires like the one that killed five people on Boylston Street in Newton in 2000, Representative Balser filed this bill repeatedly until 2008 when it was enacted. The legislation closed loopholes in the previous fire code so that more buildings are required to install automatic sprinkler systems, the most effective way to prevent fatalities from fires. It is now Chapter 508 of the Acts of 2008. This omnibus children’s mental health bill will improve inter-agency coordination and will ensure the early identification and screening of behavioral health issues in children. It was signed by the Governor on August 20, 2008, and is now Chapter 321 of the Acts of 2008. This legislation ends gender discrimination in annuity insurance products. As a result, women will no longer receive lower monthly retirement payments than men after purchasing the product for the same price. It was signed by the Governor on July 31, 2008, and is now Chapter 230 of the Acts of 2008. This legislation authorizes the City of Newton to alter its charter to allow more flexibility in scheduling certain municipal elections. The policy change comes as a result of concerns that the City might be forced to schedule an election on a religious holiday. It was signed by the Governor on June 25, 2008, and is now Chapter 152 of the Acts of 2008. This bill would prevent the use of restrictive covenants for limiting the practice area for social workers so that they may continue to see clients upon leaving a particular practice. It was signed by the Governor on August 23, 2008, and is now Chapter 323 of the Acts of 2008. This legislation protects confidential communications between clients and licensed mental health counselors (LMHC). This gives the clients of licensed mental health counselors the same protections enjoyed by clients of other mental health professionals such as psychologists, social workers, and psychiatrists. It was signed by the Governor on October 25, 2007, and is now Chapter 142 of the Acts of 2007. This bill would create a special exemption to certain seatbelt requirements for antique cars. This bill was filed when a constituent who is an antique car hobbyist called to the Rep’s attention a law that interfered with the value of the cars such hobbyists collect. It is not uncommon for the Rep to file bills that solve problems for individuals in the district. It was signed by the Governor on July 31, 2008, and is now Chapter 225 of the Acts of 2008. This bill would protect the independent evaluations requested by the family of a special needs student by ensuring that the parent-designated independent evaluators and educational consultants have adequate access for observations of a child’s current program. It was signed by the Governor on October 10, 2008, and is now Chapter 363 of the Acts of 2008. This act addressed a weakness in the system of enforcing rulings in neighborhood/boundary disputes. It ensures that the fence viewer’s rulings will be enforced by making explicit that challenges may be heard in the district court in the city where the property is located. It was signed by the Governor on November 11, 2006, and is now Chapter 366 of the Acts of 2006. This act requires private schools to notify parents if they do not perform the routine health examinations that are required of public schools such as vision testing. The act ensures that families with children who attend private schools will be aware that they need to arrange for certain public health screening privately in order to ensure the early detection of certain disorders. It was signed by the Governor on October 26, 2006, and is now Chapter 333 of the Acts of 2006. This act authorized a study to address the severity of the workforce crisis in agencies serving people with mental retardation, to determine if the health and safety of consumers receiving services from the Commonwealth were in jeopardy. It was passed into law as SECTION 358 of the FY05 Budget. This act created an opportunity for the Registry of Motor Vehicles (RMV) to produce a specialty license plate directed at motorist safety regarding bicyclists sharing the road. It was and signed by the Governor on July 28th, 2004 and is now Chapter 220 of the Acts of 2004. This act clarified restrictive covenants in professional relationships with licensed psychologists. It rendered null and void any restriction on the right of a psychologist to practice in a certain geographic area after the professional relationship that created the covenant had ended. It was signed by the Governor on July 26th, 2004 and is now Chapter 209 of the Acts of 2004. Signed into law by the Governor, November 26, 2003 and is now Chapter 121 of the Acts of 2003. The act required the Massachusetts Department of Education to develop a model policy for school committees concerning school sponsored overnight travel within one year of enactment. It was signed into law by Acting Governor Jane Swift on October 9, 2002 and is now Chapter 346 of the Acts of 2002. Regulations were subsequently developed by the DOE. This Home Rule petition corrected a mistake that would have resulted in Newton voters traveling to 2 different voting locations on the same day for a local initiative and an alderman’s special election. Newton voters’ rights and convenience were protected by this bill. It became Chapter 91 of the Acts of 2002. This act extended the protections and responsibilities regarding confidentiality that psychologists and other mental health professionals enjoy to psychology graduate trainees. It was signed into law on December 21, 2000 as Chapter 348 of the Acts of 2000. This act allowed for the protection and preservation of the historic Chestnut Hill Waterworks. It was signed into law on August 10, 2000 as Chapter 218 of the Acts of 2000. This act requires that insurance companies make timely payments to providers. It was rolled into the omnibus managed care reform bill, which was signed into law by the Governor on July 21, 2000 as Chapter 141 of the Acts of 2000. An Act providing for the disposition of certain surplus waterworks facilities of the Massachusetts Water Resources Authority and the Metropolitan District Commission located in the City of Boston. When signed by the Governor, it became Chapter 218 of the Acts of 2000. It allowed for the Chestnut Hill Waterworks properties to become a museum and housing to benefit the Newton, Brookline, and Boston community.